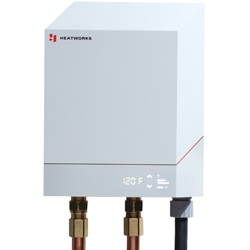 The flagship Model 3 tankless electric water heater uses Heatworks’ proprietary ohmic array (OA) technology. The electric water heater reduces greenhouse gas emissions and minimizes global footprint while also saving consumers money. Through its OA technology, Heatworks leverages the natural conductivity of water and electricity to efficiently generate heat.